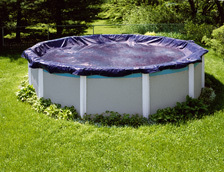 PoolTux covers are made with the tightest scrim in the industry, exceeding ASTM industry standards. The scrim is the weave tightness in the underlying thread construction. 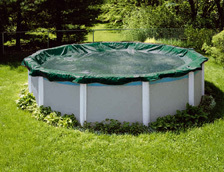 The higher the scrim number, the better the quality of the winter pool cover. If you want the best, buy a cover that's been tested year after year and proven to stand up to the harshest winters. They are built to withstand the elements and our no hassle warranty is there to stand behind it. Nobody protects more pools. 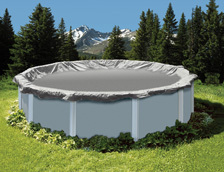 Our top of the line cover has a 4 Foot Overlap and will give you maximum performance year after year. 20 year no hassle warranty with THREE YEARS COVERED AT 100%. Our King covers have a 3 Foot Overlap and is an exceptional cover giving you greater longevity and superior wear performance. 10 year no hassle warranty with ONE YEAR COVERED AT 100%. While other covers are thin and flimsy, our Royal cover has a 3 Foot Overlap and the quality of more expensive covers. 8 Year no hassle warranty with ONE YEAR IS COVERED AT 100%.